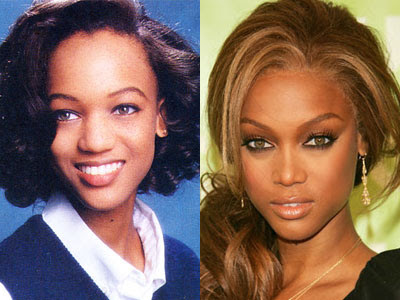 Tyra Banks before and after nose job plastic surgery? Tyra Banks is a tremendously successful American model, television host/personality and actress, perhaps best known for hosting The Tyra Banks Show, and for her work on the reality series America's Next Top Model. For as long as memory serves me, Tyra Banks has been front and center of numerous plastic surgery rumors, most notably breast implants and a nose job (rhinoplasty) procedure. Apparently Ms. Banks was tired of all the breast enhancement speculation, so while taping an episode of her talk show back in 2005, the "keeping it real" advocate unhooked her bra and let the world see them hang, however she even took it one step further when she brought out a doctor and underwent a televised sonogram. I'm tired of this rumor. It's something that's followed me forever. By no means am I saying a breast implant is a bad thing, but it's not a choice that I made. But it's something that a lot of the public think that I have, and that's so frustrating for me. The results from the sonogram exam were clear, and Tyra Banks was totally vindicated of having breast implants, end of story... or was it? One thing the that Ms. Banks neglected to mention, was her alleged nose job operation, a rumor that has been backed by some pretty convincing before and after photos. 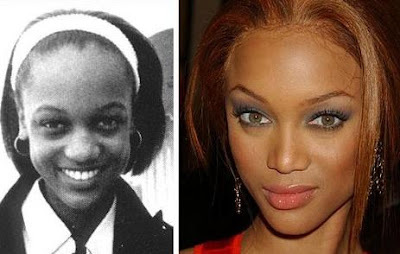 These before and after snapshots showcase Tyra Banks long before she entered into the public eye, revealing a drastically bigger and wider nose, a far cry from her current petite nose, which has an exceedingly thinner and much more defined bridge and tip. In a world of celebrity plastic surgery speculation, this is what many would consider a layup, in terms of before and after evidence. So lets hear your thoughts on Tyra Banks' alleged nose job procedure! Who cares? Leave it alone already! She is a shallow conceited person. Don't believe me? Watch the Tyra show. It is always about her. And she always 1 ups someones story and turns it about her. Some comedian said she is an alien. I can accept that ;) And really, who cares? You can't compare a picture of someone as a child to a current picture. Believe it or not things change. Though I'm not a fan of hers, I agree with the person above that says makeup can highlight the shape of a nose. are you people blind? even if she was younger on first pic, her nose can't get thinner by itself. So what if she did....good for her ! I wish I had done mine long ago.